Spooky Pooky Creations: A.T. Phooonnneee Hoooommmmeee! My January Ordeal! So. What a start to 2012. If you have been following me for any amount of time or know me at all, you know I don't like to do anything small- I go all out and do everything big. Well, I do that in all areas of my life- not just art. When I get sick, I seem to get the most bizarre and rarest things ever. It all started the first week of January. I was putting away the dishes and I poked my right index finger on a clean steak knife. A teeny-tiny prick. Itty bitty. I didn't even know I had broken the skin until the next day when a tiny cut appeared. Anyway, that same day I cut it, I had visited an empty warehouse I found with an old player piano where I busted out a beautiful ballad. Okay, I just pounded on the keys and then stole some vintage bottles that were on it. It was filthy in there, but oh-so-cool. I thought nothing more about the cut or the warehouse. That was a Sunday. Monday rolled around and I noticed the cut was a little swollen, really red, and hurting really badly. By Wednesday, it was not getting better at all. I started my new job that day, and it was just not fun being there with a sore finger and I got thrown to the dogs on my first day of work. But I hadn't seen anything yet compared to what was about to happen! That Friday I woke up and my finger was literally the size of my head. Literally. Six, count 'em SIX, shots to the finger. Or was it 7? Good gosh, I can't even remember. It was A LOT, okay? Needless to say, I was not a happy camper. But I still remained pretty positive! I began wearing my red hoodie everywhere and calling myself A.T. repeating "ooooucccchhhh, ouuucccchh!! and "A.T. phone hooommmmee. 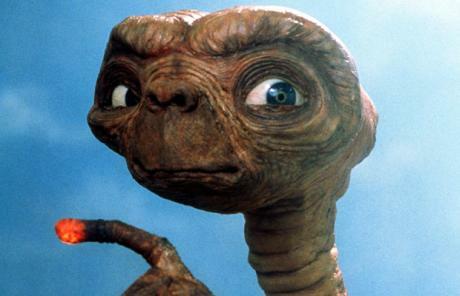 "I love E.T. and I had to exploit this. It was still all kinda funny at this point! I mean, it hurt like heck, but who doesn't wanna look like E.T! That was Sunday. I returned to work on Monday and Tuesday with my alien finger, and it was kind of miserable, but I got my co-workers to start talking like E.T. so it was still fun. THEN, it got worse. Again! What?! How can it be getting worse! I had 9 shots! I am taking 7 pills a day! I am loading this ointment crap on my finger every hour! So that is when the big guns were busted out, and I was sent to a specialist. Quirkiest darn man I have ever met! I had a hard time keeping up with everything he said, because he talked a million miles a minute and was the oddest fellow ever, unable to stay on track of one thing. You know what he told me though? "You're not from Ontario, are you?? You look too exotic to be from around here. You look like a California artsy girl!" I am not sure if somebody prompted him to say that to make me feel better or if it was just my lucky day and he really though that, but either way, it made this whole ordeal worthwhile. Anyways...getting off track here, much like the doctor did. He took one look at it and decided it was not MRSA, which is what I was being treated for. Phew. Sigh of relief. He took another slice (oooouuuuucchhhhh! *Said like E.T.) and told me to stop taking all my meds, stop using the ointments, and instead wanted me to do a 5-day infusion treatment at the hospital. Woo-hoo! My finger seems to be on the mend, this guy seems to know what he is talking about, and I get to stop taking all those pesky pills. Immediately, we headed to the hospital to start my treatments. Keep in mind, this whole time I had been very optimistic and happy still. And I was even happier, because they gave me numbing stuff for my finger and took off the stupid E.T. cast and I thought I would be able to sew and do photos and art again, finally! Oh no. Once again, I can't do anything normal and just get a simply IV. As they were prepping me for my IV, the nurses were looking and doing everything they could to find a vein in either of my arms. Unfortunately, my arms are like brittle, little pathetic spaghetti noodles and they just couldn't find any veins. Soooo...my only choice was to have it put in my wrist, right at the bend and where a kajillion nerves are sitting. This wouldn't have been a problem because the pain would be brief, but the IV catheter stays in your body for the entire treatment. So for 5 days, I couldn't even twitch my wrist without wanting to pass out. I mean, it hurt worse than anything had in this entire ordeal!!! If I lifted my arms the tiniest bit or moved a finger it was beyond painful! I spent 5 days on the couch doing nothing. It was not fun to say the least. I was bored, missing my art, cleaning and everything else. That day of having it put in and experiencing the pain was the first time I got really down and sad about it all and the next few days were pretty rough. FINALLY, this Monday I returned to the hospital for my last infusion and a follow-up with the specialist. 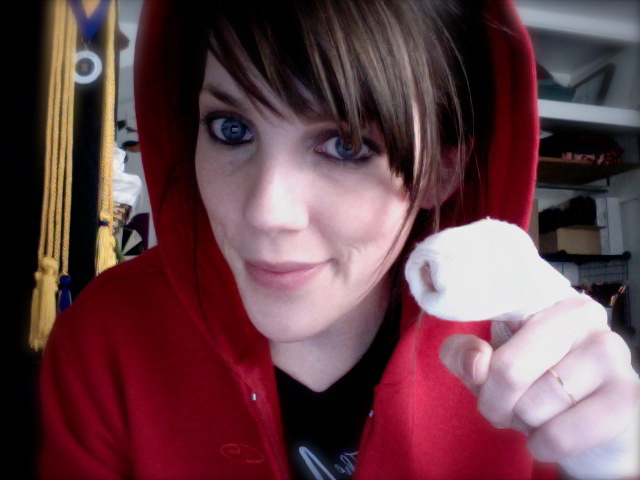 The catheter was removed and while I was incredibly bruised and sore...it felt so freakin' awesome. It still hurts, but it is nothing now. I saw the crazy, awesome doctor again that day. 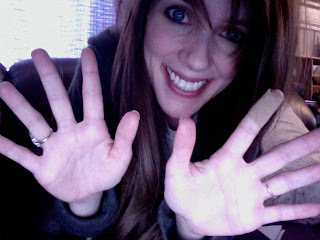 Turns out, I had a staph infection that I most likely got from my doing my little piano rendition. 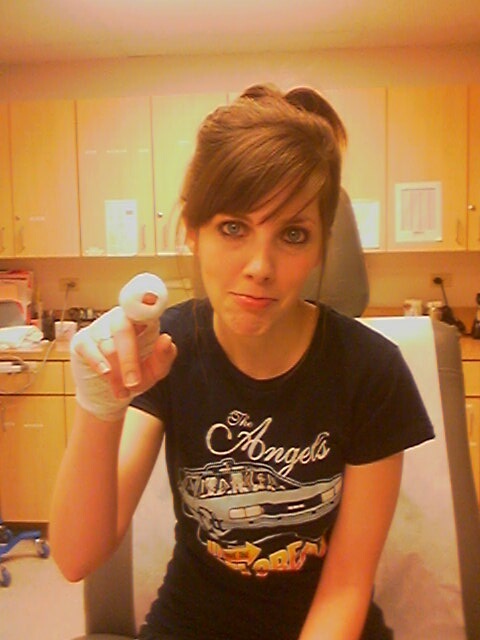 Don't play dirty pianos, kids! But the reason it never healed? I am allergic to Neosporin! The ointment I was prescribed had the same elements and that is why it was spreading and just getting worse...the more imflamed it got...the more I added. Thus making it a vicious cycle! I have always used that since I am prone to accidents, but I guess it was just not cutting it anymore and turned against me! But I will never forget my days as A.T. And I learned some valuable lessons. Be careful, be watchful and aware of your own body, and E.T. is adorable. wow! That sounds like a terrible ordeal. Jeez....who would've thought? I am so glad it didn't take them even longer to find out your allergy to Neosporin. That was enough time being in pain! :( The specialist sounds like he was a hoot. I kind of prefer the quirkier doctors, they tend to make for good stories, but also be pretty darn good at their job. Thank you for the giggle with the ouuuchhh. :) Have to find things to make you laugh when you're in pain sometimes, right? Wow. Poor you. that all sounds horrid. What a relief it's all over, for the sake of your finger and your crafting! Wow. That is just a crazy story. I am glad that you are better.